Value-added Management Consulting services to help our clients achieve growth, sustain growth, make continual improvements and edge out the competition. Inzinc Consulting India provides expert ISO Consulting Services to enable Organizations to successfully establish, implement, monitor, maintain and improve the ISO Standards and reap its benefits. Inzinc Consulting India provides value-added ISO Awareness Training and ISO Internal Auditor training in India. Aim is to improve the competence of personnel who wish to successfully implement and get certified to the various ISO Standards. With a richly experienced and a professional team, Inzinc Consulting India (A division of Inzinc Products and Services) offers consulting for various standards of ISO such as ISO 9001, ISO 14001, OHSAS 18001, ISO 27001, ISO 22301, ISO 22000, HACCP etc. 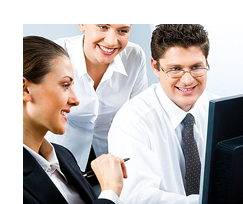 to help our clients implement the respective Management System that can help achieve their organizational goals. Apart from ISO Consulting services, we offer customized Management Consultancy Services in India where we leverage our own skills, knowledge, best industry practices and experience to support all our clients, which enables businesses to improve their bottom line, reduce cost and save time. INZINC ensures that the entire business cooperation process is seamless, fully supervised and controlled to enable project completion on time and in line with the set goals. Our third line of consulting is Resume writing services in India where we write most suitable resume for students, working professionals, freshers, senior management personnel, middle management personnel, self-employed professionals, etc to help them take the first step in realizing their career dreams. Please write to us at ic@inzinc.in or call us at +91-9379917239 for your valuable enquiries. Inzinc Consulting India (A division of Inzinc Products and Services) is a fast growing, dynamic organization that provides value added ISO Consultancy services for various standards of ISO such as ISO 9001, ISO 14001, ISO 27001, OHSAS 18001, ISO 22301, ISO 22000, etc. We are blessed with dedicated panel of professionals and lead auditors, who have rich and diversified experience in consultancy and training in many verticals. We help our esteemed clients with the training, documentation, implementation and support for the various ISO standards that provides you the competitive edge in this ever-growing competitive World. Our ISO Consultancy Services in India includes As-is Audit, Gap Analysis, ISO Awareness training, ISO Documentation, ISO Implementation, ISO Internal Auditors training, Internal Audit and MRM Conduction and Mock Audit before Certification (if necessary). Total ISO Consultancy Services: We provide total Consultancy services for popular ISO standards such as ISO 9001, ISO 14001, ISO 27001, ISO 22000, ISO 22301 and OHSAS 18001 etc. This includes documentation, training and implementation support. ISO Gap Analysis Services: To understand the gaps between your current documentation / implementation and the ISO requirements, we conduct a gap analysis for ISO 9001, ISO 14001, ISO 27001,ISO 22000, ISO 22301, OHSAS 18001, etc. These gaps will be properly reported and presented to you to enable you to understand the status quo. ISO Awareness Training Services: With expert ISO Lead Auditors, Inzinc provides awareness training for different standards such as ISO 9001, ISO 14001, ISO 27001, ISO 22000, ISO 22301, OHSAS 18001 etc. ISO Documentation Services: Inzinc provides documentation support for ISO standards such as ISO 9001, ISO 14001, ISO 27001, etc. In case you need ISO 9001 quality manual template, ISO 14001 manual template, ISO 27001 ISMS manual template we will provide you the same at our quoted price. ISO Internal Auditors Training Services: With richly experienced ISO Lead Auditors in our panel, we provide Internal Auditor training for ISO 9001, Internal Auditor training for ISO 14001, Internal Auditor training for ISO 27001. ISO Post-Certification Services: Inzinc provides Maintenance and Sustenance support to support our clients post ISO certification. 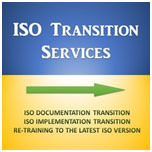 ISO Transition Services: We provide ISO Transition or upgradation services to help you upgrade from an old ISO version to the latest ISO version. Example: we consult to help you upgrade from ISO 9001:2008 to ISO 9001:2015, from ISO 14001:2004 to ISO 14001:2015, from ISO 27001:2005 to ISO 27001:2013, etc. ISO Internal Audit Services: We provide ISO Internal Audit Services to measure the effectiveness of the ISO Management System. It does not matter if your organization is yet to start the ISO implementation, you are in the middle of the ISO implementation, or you are close to the certification audit. Our ISO Consultants in India will provide timely assistance and provide value-added effective ISO consultancy to lead your Organization to successful ISO Certification. The Inzinc ISO Consultants in India are proficient to provide valuable ISO training services that include ISO Awareness training in India, ISO Internal Auditors training in India and other customized ISO training programs. The training programs designed by us provide guidance to effectively establish and implement ISO standards in shortest period of time effectively and with cost economy. We have tie-ups with various ISO Certification bodies in India who are well known ISO accredited certification bodies in India (including ISO certification bodies in Bangalore). Our ISO certification consultants provide a total package of ISO Consultancy services in India and ISO Certification services in India. Our tie-up ISO Certification bodies in India include ISO Certification bodies with good accreditations such as UKAS, ANAB, JAS-ANZ, NABCB, DAkks, DAC, etc. We can recommend good ISO Certification bodies in India based on your budget and the ISO Certificate value you require. We provide the right recommendation for ISO 9001 certification in India, ISO 14001 certification in India, ISO 27001 certification in India, ISO 22000 certification in India, ISO 22301 certification in India and OHSAS 18001 certification in India. For more details, check out our ISO Certification Page. Our Competent ISO Consultants team in India provide the ISO documentation that is just sufficient to your business requirements and at the same time satisfy the ISO standard requirements. Thus, we do not burden our clients with unnecessary ISO documentation that will make the management system complex to maintain and improve. We provide ISO 9001 Documentation services in India, ISO 14001 Documentation services in India, ISO 27001 Documentation services in India, ISO 22301 Documentation services in India, ISO 22000 Documentation services in India and OHSAS 18001 Documentation services in India. Inzinc Consulting India (A division of Inzinc Products and Services) provides the ISO Implementation services in India to our various clients across the world. This includes ISO 9001 Implementation services in India, ISO 14001 Implementation services in India, ISO 27001 implementation services in India, ISO 22000 Implementation services in India, ISO 22301 Implementation Services in India and OHSAS 18001 Implementation Services in India. Our ISO Consultants in India formulate the ISO implementation plan and take our clients through the ISO implementation steps through the ISO implementation process professionally (through an ISO implementation checklist) to reap the ISO implementation benefits of the ISO standard. 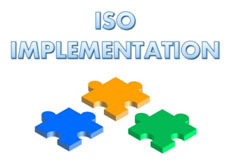 This ISO implementation exercise can be used as ISO implementation guide by our respected clients. The ISO implementation timeline will be honoured by the joint co-operation of our ISO consultants and the Client organization. Even after your organization is ISO certified, we offer ISO Post Certification Services to help you sustain and stabilize the Management System. We ensure that your ISO Management System is continually improved, you conduct ISO Internal Audits at the planned frequency and ensure the required level of compliance so that there are no issues during the surveillance audits or during recertification audits. Our ISO Certification Consultancy is provided with professionalism at reasonable cost and within a reasonable time frame. It is our professionalism that has ensured a high success rate. The ISO ensures that the standards that they publish are revised to make them relevant to the current situation, current environment, current methods and practices and latest technologies. Inzinc Consulting India (A division of Inzinc Products and Services) provides Transition services from previous versions of ISO standards to the latest ISO Standard version. We enable smooth transition by efficiently mapping of ISO clauses from the previous ISO standard version to the latest ISO version and suggesting the changes in the ISO documentation and ISO implementation. Call us on 9379917239 for ISO 9001 / ISO 14001 / ISO 27001 transition services in Bangalore (Bengaluru), Mumbai, Chennai, New Delhi, Kolkata, Hyderabad, Hosur, Trivandrum, Pune, Ahmedabad, Jaipur, Gurgaon, Noida, Bhopal, Raipur, Coimbatore, Belgaum, Hubli, Dharwad, Shimoga, Tumkur, and other cities in the states of Karnataka, Tamil Nadu, Andhra Pradesh, Telangana, Kerala, Goa, Maharashtra, Gujarat, Rajasthan, Madhya Pradesh, etc. Our Expert ISO Consultants can provide ISO Internal Audit Services to measure the effectiveness of the ISO Management System. We provide ISO 9001 Internal Audit services, ISO 14001 Internal Audit Services, ISO 27001 Internal Audit Services, ISO 22301 Internal Audit Services, ISO 22000 Internal Audit Services, OHSAS 18001 Internal Audit Services in Bangalore, Chennai, Mumbai, Delhi and other cities in India.